Ideal for outdoor shoots where you need extra light, the Aputure LED outdoor lighting kit now available for hire. The kit includes two Aputure LED panels, lighting stands, boa shot bags and a 2 piece v-lok battery kit to power the lights. 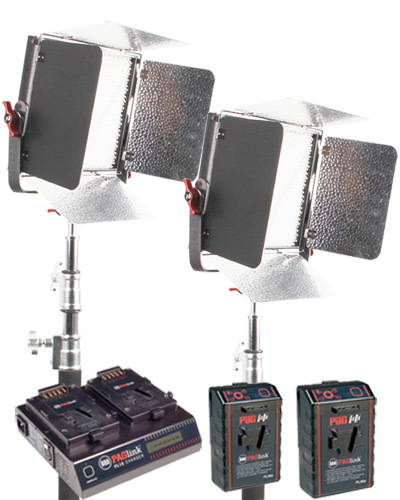 The Aputure Light Storm LS 1c high CRI LED lighting panel kit (2 LED panels with light stands) features adjustable daylight or Tungsten soft light ( 3200K and 5500K) with dimming from 0-100 and remote control. The LED panels are smaller then normal 1x1 panels and have the control panel and battery plate separate to the panel to allow them to be smaller and not need any cooling fans so they are cool and quiet. With a truly impressive CRI of 95+ (typical 98) and the ultra tough aluminium build quality, makes this LED panel light stand out from the rest. Each LED light panel comes with a control box which controls light output (dimmer) and the colour temperature and hangs from the light stand similar to dedo lights dimmer units. The V-lok battery is connected to this controller. The Pag V-lok dual battery kit consists of a dual charger and 2x 95 watt hour v-lok batteries. Each battery will power an LED panel for around 2 hours with the panel set to full power, 2.5hrs at 80% and up to 3.5hrs at 50%. (as with all batteries, time may vary due to conditions).